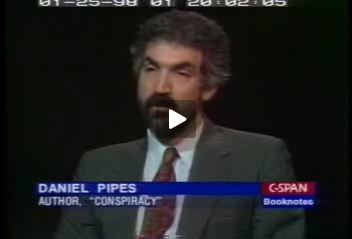 Dr. DANIEL PIPES (Author, "Conspiracy"): My book "Conspiracy" is about a way of thinking that originated about two and a half centuries ago and has had major and terrible consequences for the world. Dr. PIPES: Well, conspiracy is a collusion among more than one person to engage in illegal act--activity. But my topic here, despite the title, is not so much about conspiracies but about conspiracy theories--the wrong-headed fear of conspiracy, the overwhelming, overpowering and exaggerated fear of conspiracies. Dr. PIPES: Well, Oliver Stone is an extreme conspiracy theorist, but he's a playful sort. I'm not saying that playful is without consequence or without damage, but he isn't really--he's not someone who's poor, he's not someone who's a political extremist, but he's playing with these ideas. I think it's harmful because at stake is how you and I see the world. Are we gonna look at it straight or are we like the conspiracy theorists who are gonna say, 'Things are not what they appear to be. There's someone out there who's trying to web--to--to spin a web of--of intrigue against us'? Dr. PIPES: I got it in the history of the Middle East. And my first book, my PhD, was on the early history--the very origins of Islam, trying to understand how Islam, which is a religion, can have such a widespread impact on the life of Muslims. So I took up the topic of the use of slaves as soldiers and why, only in the Muslim world, do you find the systematic use of slaves as soldiers? From India to Spain, throughout the Medieval period, slaves were used as soldiers and nowhere else on a regular basis. And I asked, 'How could this be connected to Islam?' and m--several of my books since then have been in Islam and its role in politics. Dr. PIPES: Well, it's not exactly hard to understand, it's just boring and turgid, sort of long-winded and with lots of excursuses. It's not written in a style that would keep your attention, and there's some--there's some bizarre ideas in there--for example, the notion that the 1890s was when the first subways were being built around the world and there was some worry that these subways would be used by revolutionaries, and in the Protocols, the so-called elders are saying, 'Well, let's use the subways to bomb the cities,' an idea that dates back a century ago--no one would think of it now, but full of--full of strange ambitions. The Soviet Union, Nazi Germany--he'll say, 'Well, they're not really all that powerful,' never mind that these are enormously influential, powerful totalitarian states with huge armies and arsenals. The Council on Foreign Relations, which is a group of like-minded people who meet together and have study groups and listen to talks, is deemed an all-powerful organization. The United Nations, which can barely scrape together a budget from year to year, is deemed all-powerful. It's a typical mistake of the conspiracy theorist. Things are not what they seem to be; therefore, the weak is really the powerful, the powerful is really the weak. It's a very consistent mistake. Dr. PIPES: Catholics were welcome but were not, by and large, allowed by the church. Church very much discouraged it. It's basically a Protestant organization, flourished in the Protestant countries, by and large, though not exclusively, and it had a function--had a real function. Today it doesn't have all that much of a function. There's so many places for people to meet. But because of the extravagant qualities of the Masonic lore, the suspicious, the conspiracy-minded said, 'Ah-ha, here is the source of power.' And from the late 18th century, two centuries ago, 200 hundred years ago, until today, this is one of those themes that keeps getting repeated and repeated and repeated. There are other organizations which are even more obscure. The Illuminati existed for eight years, from 1776 to 1784--interesting and relatively influential group in its small way. But at the time, the opponents of this event, of this transformation of French life believed that there had to be an explanation, a rational step-by-step explanation--the chaos--they had no place in their interpretation for chaos. And a significant number of them said, 'Well, the French Revolution was planned in advance by the Illuminati, the Masons, the Jacobins and others, and they planned it out step-by-step. And it's the legacy of that interpretation and the books--one book in French, one book in English--came out almost exactly 20 years ago that we're now still reeling from. They created, they memorialized and--and put on paper these ideas. And as I said before, the best illustration would be Pat Robertson's 1991 book, which is a regurgitation of these 1790s ideas. They're modernized, of course, the examples have changed. But the themes and even the perceived enemies are to a very great extent the same ones. A second point would be that the right tends to be the far right, the hard right, tends to be very explicit about its conspiracy theories, talks about them, whether it be Hitler or the American far right. The left is far more subtle. And perhaps the--the--the best illustration of this is Stalin, who was maniacally conspiracy-minded, and yet, he somehow or other fooled everyone to the point that it was only three years after his death when Khrushchev gave his famous speech in 1956 that the party and then the world became aware of what Stalin had been up to. And so, too, in American life, the right tends to be crude and overt in its conspiracism. The left is elegant and sophisticated and subtle. And so take Noam Chomsky vs. Mark of Michigan. Mark of Michigan is a janitor by day and he has loudmouth ravings. Noam Chomsky is one of the brilliant intellectuals of this century, a man who changed our understanding of the human mind, a fluent polemicist who's written book after book on important subjects. Sophisticated is an understatement. And yet, his view of the United States government is as conspiracist as Mark of Michigan. So there is this mirror imaging on the two sides, and yet, the left gets away with a lot more, in large part because of the elegance with which it purveys its conspiracy theories. Dr. PIPES: Benjamin Disraeli was a British prime minister in the '50s and '60s--1850s and '60s. He was a brilliant writer, just generally a brilliant parliamentician. And he would play with conspiracy theories and he would make statements in his books, sometimes fictional, sometimes on the floor of the House of Commons, about the conspiracy to control Europe. And these remain 150 years later important proof texts for conspiracy theorists to say, 'Aha, look, Benjamin Disraeli said it.' And there are others like this. LAMB: No, what year was it, like, for instance, it became like Hitler, 'I wanna exterminate Jews'? It had nothing to do with Christ, it had something to do with the way he felt about the people. LAMB: In the back you have a--three appendic--pendix--ap--three appendices--appendix C, 60 greatest conspiracies of all time you list and you can find it at www.conspire.com/conspire/symbol. I mean, you alm--you alm--I--you almost have to buy your book to find it. LAMB: Up here you have a dedication. This is to my elder daughter, an avid reader. Why to her?